In support of the just struggle of the people of Jammu and Kashmir, Kashmir Solidarity Day was observed at the Pakistan High Commission, Ottawa. The event was largely attended by Kashmiris and Canadians of Pakistani origin. While speaking on the occasion, Acting High Commissioner Muhammad Saleem underlined the importance of resolving the Jammu and Kashmir dispute in accordance with the UN resolutions and the aspirations of the people of Jammu and Kashmir. He highlighted that the Report of the Office of the High Commissioner for Human Rights (OHCHR) on Jammu and Kashmir calls for the expedited establishment of a Commission of Inquiry to look into the human rights situation in Indian Occupied Kashmir. He also urged the international community to fulfil their commitments towards the people of Jammu & Kashmir under the UN Security Council resolutions. 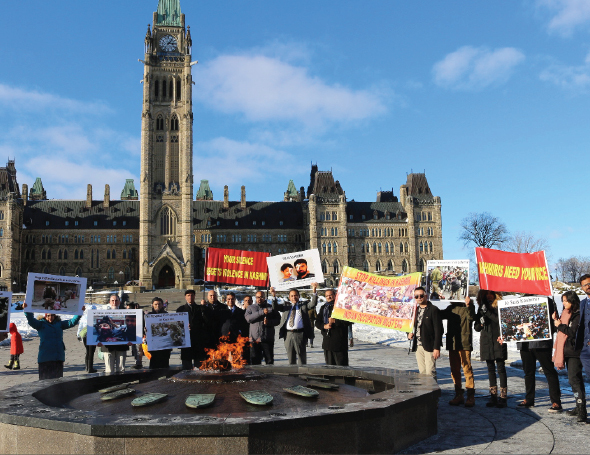 Earlier during the day, A peaceful demonstration was held in front of the Canadian Parliament to express solidarity with just struggle of the Kashmiris and to condemn brutal carnage being carried out by the Indian occupational forces. The messages of the President and the Prime Minister of Pakistan were also read at the event. The participants held placards highlighting sufferings of the Kashmiris at the hands of Indian armed forces in held Kashmir. They chanted slogans against human rights violations in the valley to draw the attention of the international community towards the gross human rights violations and use of pallet guns against innocent civilians.